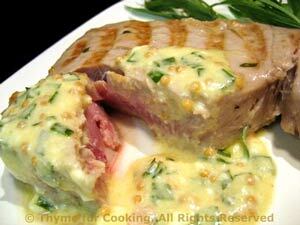 Grilled Tuna, Mustard Sauce, Thyme for Cooking easy gourmet dinner. The fish is simple, the potato salad complex... Get the best grade of tuna you can. I buy 'white' which I prefer to 'red' - those are my choices. Substitute halibut, or other firm fish. If you get sushi-grade tuna you will definitely want to have this rare (it has to be graded to a higher standard so it's okay to eat raw). Regular tuna we normally have medium. If it gets to close to well done it tends to be dry. The Mustard Sauce adds a rich finish to the dish. Mix tarragon, oil, lemon juice and white wine. Spoon on to tuna and let marinate for 10 - 15 minutes. Remove tuna from marinade and cook on barbecue grill for 3 - 5 minutes per side (depending on thickness) for regular tuna, 1 - 3 minutes for ahi. Or until done to your liking. Can also be cooked under broiler or sautéed in nonstick pan for roughly the same amount of time. Place tuna on a platter, spoon a bit of Mustard Sauce over and serve, remaining sauce on the side. In small saucepan (or in micro) heat white wine, yogurt and mustards, stirring, just until hot and well combined. Stir in tarragon and allow to cool. Spoon over fish to serve. Warm, crisp, sautéed potatoes, mushrooms and garlic enveloped in creamy, melted soft goat cheese, finished with lots of fresh basil and chives - this is not your ordinary potato salad. Full of complex flavors, it is best served with simple, grilled meat of fish. Slice potatoes into quarters the long way and then 1/2" (1.25cm) thick slices. Heat 1 tbs oil in large nonstick skillet over medium heat. Add mushrooms, garlic and sauté until they start to brown, about 5 minutes. Remove to a bowl and set aside. Do not cover. Add remaining tbs oil and potatoes to skillet. 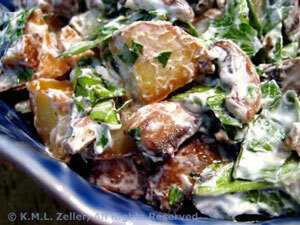 Toss a bit to coat potatoes with oil, then cover and let cook about 10 minutes. Uncover, stir and let sauté, turning occasionally. You want them nice and brown. If they start getting too brown before you are ready to finish just turn the heat to low and keep warm in the skillet. When ready to finish add potatoes to mushrooms and garlic. Add chevre and toss to coat - the cheese will melt a bit from the heat of the potatoes. Snip basil and chives with scissors and add, stirring to combine. Serve. 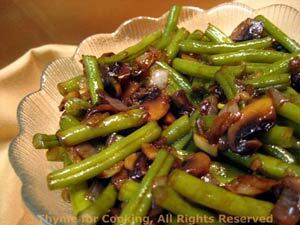 Sautéed mushrooms and onions top these green beans, that are lightly flavored with soy sauce. Top and tail beans... cut off the ends. Cut into 1 1/2 inch lengths (4cm) or leave whole. Put beans, 1/4 cup of water into a small saucepan, cover and simmer until done, 10 - 15 minutes. If beans dry out add a little more water. Heat butter and oil in small skillet. Add onion and sauté until tender, about 5 minutes. When beans are done, drain and add to the skillet along with the soy sauce. Stir well to combine and serve.